Industrialist Henry J. Kaiser established three shipyards in the area during World War II, two in Portland and one in Vancouver. Kaiser’s Northwest shipyards produced some 752 ships for the war effort. 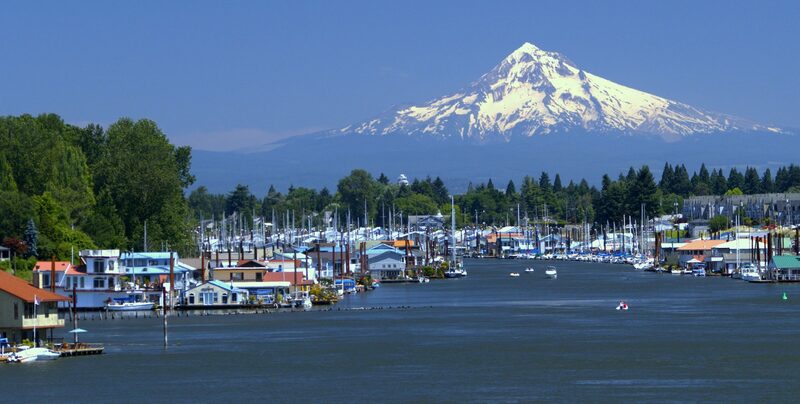 Opening in 1941, Kaiser initially built a shipyard on the Willamette near Portland’s St. Johns neighborhood. The original 87-acre site grew to more than 300 acres. Kaiser next opened a 200-acre Vancouver Shipyard, upstream from the Interstate Bridge and began production in early 1942 with an initial payroll of 38,000 workers. The Kaiser Company then launched the Swan Island shipyard on nearly 400 acres that had served as Portland’s Municipal Airport. That shipyard began operation in July 1942. Liberty Ships were large and slow-moving vessels that hauled cargo across both the Atlantic and Pacific oceans in World War II. 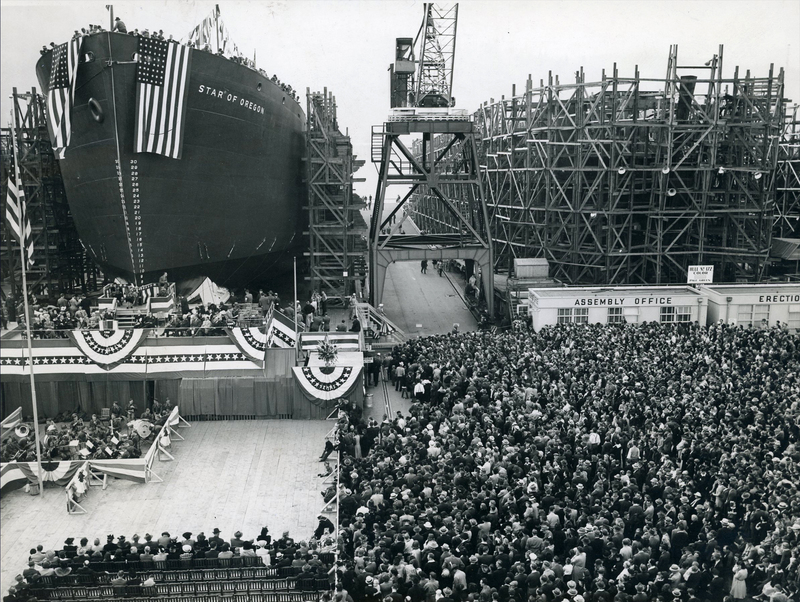 More than 300 Liberty Ships were built by The Oregon Shipbuilding Corporation – more than any other shipyard in the country. More than 2,700 Liberty Ships were built for the British and U.S. governments. The shipyards attracted workers from across the nation, particularly from the South. Thousands of African Americans contributed to an increase in Portland’s black population, which grew from 1,800 before the war to an estimated 15,000 in 1946. Kaiser also attracted some of the estimated 40,000 Native Americans who left reservations for the first time to work in defense industries. In addition, the shipyards brought large numbers of women into the industrial workforce; women constituted about 30 percent of the shipyard workforce at the end of 1942. By the end of 1945, only about 10,000 men and 2,000 women worked in the three Northwest yards. 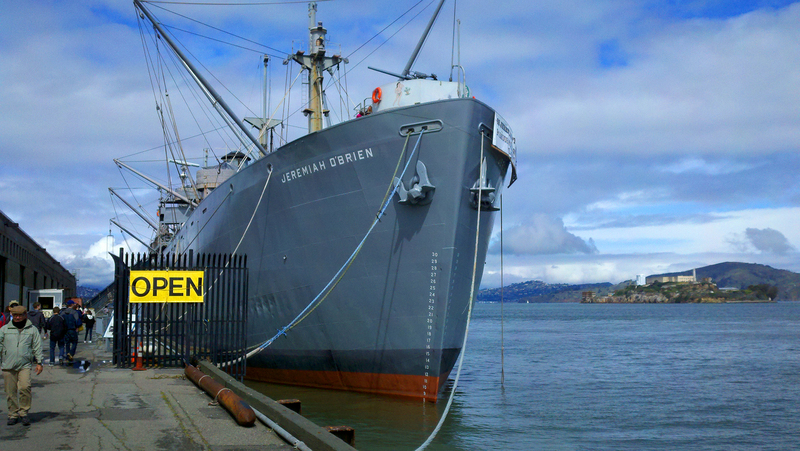 Two former Liberty Ships are converted into floating docks by the Port of Portland. The flat top of the S.S. Jane Adams can clearly be seen along Terminal 6 (above) across from West Hayden Island, while the lower hull of the S.S. Richard Henry Dana is visible along Terminal 4. Both were built by the California Shipbuilding Corp. in Los Angeles. During frenzied activity between 1942 and 1946, the Oregon and Washington shipyards built and sent off to war 141 vessels of several types, including aircraft carriers, Liberty ships, LSTs (landing ship, tanks) and transport and cargo ships. Today, only two remain in serviceable condition, both museum ships: The John W. Brown in Baltimore, and the Jeremiah O’Brien in San Francisco.